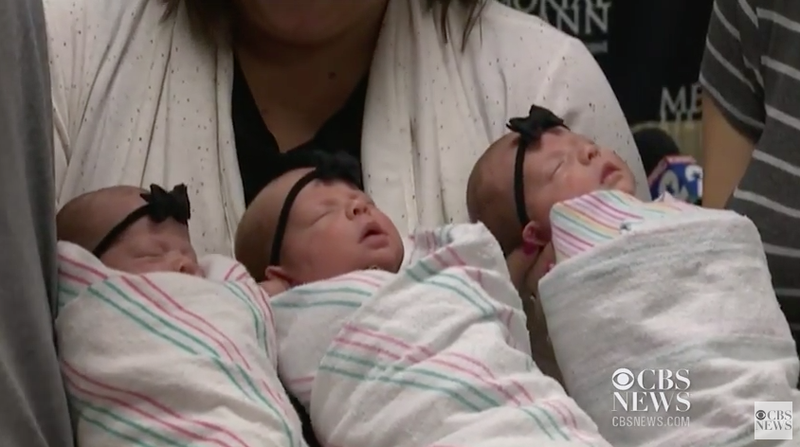 The identical triplets headed home from a Houston hospital today are being called “one in a million” multiples by doctors. The reason we don’t have more identical triplets running around is very simple—and it probably goes against what you’ve heard about twins (or triplets, for that matter). There are two types of multiples: monozygotic (identical) or dizygotic (fraternal). Dizygotic multiples occur when more than one fertilized egg becomes an embryo. Monozygotic multiples occur when the egg divides after fertilization, meaning that the multiples share the same DNA. Scientists don’t really understand why the fertilized eggs—called zygotes at this point—decide to split, but it doesn’t happen as often as two separate sperm fertilizing two separate eggs. For identical triplets to happen, that zygote needs to split two times, which is even more rare. Contrary to popular belief, identical twins don’t actually run in families. Fraternal twins might, if the women in a particular family share some genetic trait that makes them more likely to release two eggs during an ovulation cycle instead of one. But for now, there’s no evidence of a genetic predisposition for zygote splitting. So there you go. Just because you’re a mom who is a twin, or has twins in your family, it doesn’t mean that you’re more likely to have identical twins. It just means you might have inherited a tendency to ovulate two or more eggs at once (which doesn’t even guarantee twins, actually). Because if identical twins were genetically determined, identical twins would be more likely to have identical twins, and there would be many more identical twins (and therefore the chance of many more identical triplets) on the planet. Instead, it’s totally and consistently random—about three births per 1000 worldwide are identical twins. Now look at these cute monozygotic multiples.